Stock House reports that what's happening on the inflation front? What's happening on the inflation front? The Fed scaled back its money-pumping efforts over the first three months of this year, which is not surprising given that it would have been almost impossible to sustain the frenetic pace achieved during the final four months of last year. But even though the Fed's actions have become less frenzied of late, the Fed-Treasury tag team has made sure that the rate at which new money is borrowed into existence continues to exceed, by a substantial margin, the rate at which money is extinguished via debt repayment. This has mostly been accomplished via the U.S. Government increasing its debt load at a much faster pace than the private sector de-leverages. As mentioned in previous TSI commentaries, the private-sector debt bubble is in the process of being replaced by a public-sector debt bubble. 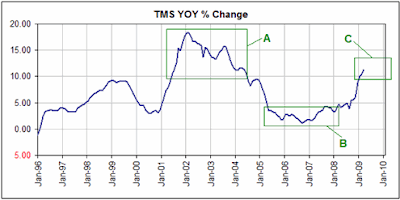 The following chart shows the year-over-year percentage change in True Money Supply (TMS). Note that TMS does not include bank reserves. When the banks eventually start lending their excess reserves the result will be a further increase in TMS, but there is no telling when that will happen. It could, for example, happen within the next few months, but on the other hand the commercial banks could decide to sit on their excess reserves for several years. Either way there is likely to be a lot more monetary inflation over the coming 12 months for the same reason there has been a lot of monetary inflation over the past 12 months: increased government borrowing and Fed monetization of both government and private debt. On the above TMS chart we have identified three separate periods. Period A (mid-2001 through to mid-2004) had fast money-supply growth, Period B (early-2005 through to early-2008) had slow money-supply growth, and Period C, which began during the final quarter of 2008, has thus far been characterized by fast money-supply growth. The fast money-supply growth of Period A fueled rapid price rises in houses, housing-related debt securities and commodities, and the slow money-supply growth of Period B led to large price declines in houses, housing-related debt securities and (eventually) commodities. The fast money-supply growth of Period C WILL fuel rapid price rises SOMEWHERE in the economy. There is nothing novel or complicated about the theory that fast money-supply growth over a prolonged period leads to substantial price rises and that a subsequent sharp slowing in the pace of money-supply growth causes prices to retrace; it is just basic supply and demand. However, the effects of monetary inflation are non-uniform and the time delays are both lengthy and variable. The challenge, therefore, lies in determining which prices will be affected the most by the money-supply changes and how much time will elapse before the effects of the money-supply changes become evident in prices. This is not only a challenge for investors; it's also a challenge for policymakers. One of the main problems faced by policymakers (central banks and governments) in their efforts to manipulate the economy to their own best advantage is that they will always be able to inflate the money supply but they will never be able to control the effects of the inflation. Sometimes they will get lucky and the right things (stocks and real estate, for instance) will be the primary beneficiaries of the inflation, but at other times they will be unlucky and the wrong things (gold and oil, for instance) will gain the most ground in response to the inflation. We suspect that over the next few years they will be as unlucky as they can be in that gold will be by far the biggest winner. Bernanke and his Fed cohorts will naturally say that they plan to remove much of the recently injected money once the economy recovers [impossible]. In all likelihood they will also go as far as making preparations to drain away the "excess liquidity"; for example, getting approval for the Fed to issue its own bonds. This is all part of managing inflation expectations ["inflation expectation"= confidence in the dollar's purchasing power. "managing inflation expectations" = misleading world into thinking the dollar is still worth something.]. However, there is almost no chance that the Fed will actually engineer a significant slowing in the rate of money-supply growth until it is way too late [agreed, but this isn't the right question. The fed is planning a 15-Fold Increase In US Monetary Base, so simply engineering "a significant slowing in the rate of money-supply growth" isn't going to bring prices under control when the inflation starts. The only way the fed will be able to "control" inflation is by ] (until a major inflation problem is 'baked into the cake'). The reason is that the inflationary policies implemented to date will not only fail to turn the economy around, they will very likely make things worse. To put it another way: the harder they try to stimulate the economy by creating money out of nothing the more economic damage they will do (counterfeiting money transfers wealth from productive enterprises to the counterfeiter and thus reduces the economy's growth potential) and the longer it will take for a sustainable economic turnaround to begin. One of the most popular arguments against having gold as money is that a gold-based monetary system would be inflexible, the implication being that today's dynamic economy requires a more flexible, or elastic, form of money. Well, if by "inflexible" it is meant that under a gold-based monetary system the supply of money could not be arbitrarily expanded by governments and banks, then yes, a gold-based monetary system would be inflexible, but such inflexibility is a consummation devoutly to be wished [agreed]. In our opinion the ideal money would be as constant as the sun, enabling each of us to calculate exactly how much money we needed to save to cover our future living expenses. Today's official money is very flexible, and it's not hard to see the cost of this flexibility. 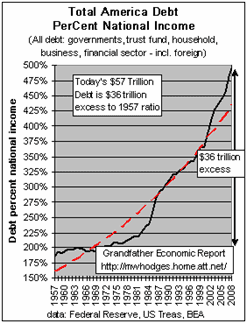 The following chart from http://mwhodges.home.att.net/nat-debt/debt-nat.htm reveals one method of quantifying this cost. The chart shows that the total quantity of debt in the U.S. economy was around 185% of net national income in 1957 and was still around this level at the beginning of the 1970s. However, by 2008 the total debt had grown to about 500% of net national income. Bear in mind that the current "flexible" monetary system came into being in the early-1970s. In other words, the introduction of "flexible" money led to a veritable explosion in the quantity of debt. 1) The private-sector debt bubble is in the process of being replaced by a public-sector debt bubble. 4) The "inflexibility" of a gold-based monetary system is what makes it desirable (no currency collapses). 5) By 2008 the total debt had grown to about 500% of net national income. This entry was posted in Background_Info, Currency_Collapse, Market_Skepticism. Bookmark the permalink. The only way the fed will be able to control inflation is by .... What? When would you expect inflation to start, in one year, 2 years, as an educated guess? It's very hard to guess when price inflation will start. Would money velocity analysis give a clue? "The only way the fed will be able to control inflation is by .... What? Also how can an increased base money(Fed Reserve Note supply) cause inflation if those newly created Fed Notes can't leave the banks because of the enormous credit contraction which even after all the printing and increase in base money to this day still dwarfs the amount of Federal Reserve Notes created thus far? I tell you that it is more likely that we see massive defaults than it is we see a return to easy credit. If base money is not increasing enough to stop the credit contraction, then that base money won't be lent out to circulate and devour goods to cause shortages and thus rise in prices. Base Money still has a heck of allot more to go to stop this credit contraction. The question you all should be asking is not when all these newly printed Federal Reserve Notes will leak out in to the economy but how many Federal Reserve Notes need to be created in order to allow the Fed Notes to leak out in to the economy. When you answer that question, you'll realise that we are allot closer to massive defaults than we are easy credit/dollars flooding the streets. I mean think about it the government is using quantitative easing and a Zero Interest Rate Policy and credit is still contracting! That means if we were to ease up on the printing even just a little bit, there would be massive defaults. They even went as far as saying holders of the devaluing debt should price the debt at whatever price they want with this suspension of mark to market. These people are out of ideas. How can people talk about the increase in the monetary base leaking out through easy lending and causing inflation when the govt. is printing at full capacity and can't stop credit from contracting. I'm trying to understand how this increase in the supply of Federal Reserve Notes will cause inflation when the credit contraction is so large. I think the printing we are doing now is nothing compared to the printing we'll need to do to prevent massive defualts which will require printing larger notes than $100 bills. tries to explain the hyperinflation that is coming. That massive vertical shot up in the monetary base is a massive increase in the monetary base but it still isn't enough to stop the credit contraction which is preventing those Fed Notes from being lent out and circulating the economy. I think allot of people are confusing the easy credit era with this massive printing era. From what I understand, when they say money is being created out of thin air, this does NOT speak of the Federal Reserve Notes that are being printed up, this speaks of the process of Fractional Reserve Banking when someone's money is lent out but not removed from their bank's deposit statement or the non reserve requirement debt. That's money out of thin air because the dollars to back that debt(deposit) are not there, they have been lent out but we still consider that deposit/debt to be money. When they say "money out of thin air" this is what they are talking about NOT the printing of Federal Reserve Notes. And the thing is money is no longer being created out of thin air, infact the money that was created out of thin air is erasing. We are now actually creating tangible money(Federal Reserve Notes). The thin air money is the insolvent banks/debt and the so called "toxic" debt. The debt that was not lucky enough to be the last to hold the Federal Reserve Notes when this credit crisis began. An example of thin air money would be the fraction of your bank account that's not required as reserve by your bank. We've been creating money out of thin air especially with recent practices of no reserve requirements. But now we are no longer able to create money out of thin air(credit contraction) (unless you consider the expansion of the public debt which is no where near as large as the private debt): The govt. (US Treasury) borrows Fed Notes from the Fed and the Fed lends it's Fed Notes to the US Treasury and that loan is to be paid back with interest at some point in time but in my opinion, just as I believe that the Fed's lending programs for the so called toxic debt is permanent and not loans but buys, I believe the Fed does not intend on calling in the loans it made to the Fed, meaning there is no intention to pay off this increasing public debt, nor is it possible seeing as the money to pay off the debt comes from the Fed who charges interest to have it's Fed Notes. The Fed's swaps of it's Fed Notes for US Treasuries is just a method like it's TALF and TARP programs to prevent the US Treasuries from default. Everything the Fed is doing is to prevent debt default. But back to what I was saying, that money that was created out of thin air is evaporating and we are forced to create tangible money(Federal Reserve Notes) so as to stop those holding thin air money from loosing their money and trust in thin air money(debt). Trouble is, there's a heck of allot of thin air money(debt) out there and very little tangible money(Federal Reserve Notes/currency) compared to that thin air money. Another problem is that the thin air money is allot greater than the total price of all the worlds goods and services. So one of 2 things will happen: 1. there will be massive defaults leading to massive lost trust in holding thin air money(debt) destroying the banking system and causing people to hoard their money themselves(bank runs) causing borrowing costs and thus consumer prices to rise(as businesses survive off of borrowing) destroying the currency and because of rising prices people will run to things that are durable, portable and rare(gold and silver) as barter(money). Or 2. we will make those holding thin air money whole by printing enough tangible money to stop defaults but in doing so we encourage people to trust in thin air money(debt) as the bailouts give those holding debt trust that the debt won't default and they resume/continue increasing the supply of thin air money through fractional reserve banking/lending and this money being allot greater than the price of all the goods and services on earth cause shortages of those goods and services and thus prompts those providing those goods and services to increase their price. Both scenarios leading to rising prices. Some people think this credit crunch was engineered by the govt. so as to stop the rise in prices of things which was destroying the dollar but that's nonsense because right now Federal Funds rates are lower than ever and the Fed is practicing quantitative easing which is a method of preventing defaults on debt by trading thin air money(debt) for tangible money(Federal Reserve Notes). There was one Austrian economists( i forget who) that said something like either the credit will contract voluntarily or it will on it's own eventually. Looks like we chose the latter. good when it's getting the same treatment from the Fed as the so called "toxic debt" is getting with programs like TARP and TALF. Quantitative Easing is the same thing as TARP and TALF and US Treasuries are included in this program. Quantitative Easing tells us that the US Treasury needed a bailout. Quantitative Easing is a bailout for the US Treasury. We face massive defaults in the near future and i believe it is unstoppable without Weimer and Zimbabwe size bills which the govt. will do to keep this banking system going as long as they can keep it going but we already know the outcome of Weimer and Zimbabwe. Me and my long winded replies. "The only way the fed will be able to �control� inflation is by..."
Stopping defaults and at the same time discouraging easy credit. Both of these methods contradict each other. By not allowing defaults, the govt. encourages easy lending without a care because the lender is given confidence by the govt. that he will not default. And the govt. can't allow defaults or the banking system and the currency along with it (through rising borrowing costs and thus rising consumer prices) collapse. So there is no way the Fed will be able to control inflation. The Fed has been controlling inflation for decades and now the debt is too large and inflation can be controlled no more. If it allows defaults, we'll have inflation and if it prevents defaults we'll have inflation.